Who's ready for a Give-A-Way??? 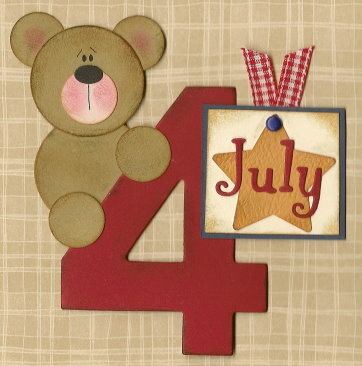 This is a July 4 Paper Piecing Bear handmade and designed by me! It's a brand new design and I've just added it to my Paper Piecing Blog! To be entered to win the one that I will be giving away ... just leave a comment and tell me what is your favorite thing about the 4th of July! If you are not a member of Blogger ... that's okay ... just leave your comment using the "anonymous" option and when leaving your comment make sure to sign it using your first name and last initial. On this particular bear ... I can add a matching gingham bow for a girl or a matching cap for a boy. Or ... I can leave it just as it is. You can decide that if you win! I will accept comments through July 3rd, 12:00 pm eastern time for the give-a-way drawing. Everyone who enters via a comment left on my blog will have their name put into a hat and I will draw the winning name July 4th. I will then announce the winner right here on my blog on July 4th morning! And ... if you really like this July 4 Bear ... I also have a similar July 4 Girl and July 4 Boy available on my Paper Piecing Blog. CLICK HERE to see these new items along with several more new Paper Piecings as well!! The newest issue of "Cooking With Paula Deen" delivered to my mailbox. Watching Mike and Griffin being silly ... cooling down after working outside in the summer heat. Care to share three things that made you happy yesterday? I would LOVE to hear about them in the comments section! Do you remember when I shared that I had won a give-a-way from my dear friend Cecile's Blog? The package she sent arrived yesterday! This is the Core'dinations ColorCore Cardstock collection ... wow ... just look at this paper yumminess ... look at that rainbow of colors!! And she also included this darling handmade card ... it is SO cute!! I love pink and black together! Ya'll have to visit her blog ... Click Here to do so! Thanks sooo, soooo much Cecile! When my friend Carol and her kids were over the other day we were talking about Mr. Bubbles. I told her that I couldn't find them in the store ... I had looked everywhere!! Well, late yesterday afternoon I heard a knock at my door and there our sweet friends Carol and Sam were bearing some Mr. Bubbles for the G-Man! Oh my goodness ... what a nice thing to do! Thank you, Thank you, Thank you! And ya'll just look at this ... my "little bountiful harvest". I am just amazed that we have food growing in our yard!! Here you will see a tiny pear and plum from our fruit trees in the back yard. We have five plum trees and one pear tree. I'm not really sure if they are suitable for human consumption, but the squirrels sure do enjoy them. The bright green thing on the right is actually a tomato from my little garden. I actually didn't intend to take it from the vine ... but I was checking on them and it just fell off in my hand. I brought it inside to see if it would ripen. And finally ... the birds haven't found the wild blackberries yet!! They've had time to ripen and turn purple (they were red). Griffin and I had fun picking a few. We had to be very careful because they have alot of tiny little thorns. And, I had no idea how much they would stain our hands. Mike is out this morning taking a flying lesson. I think Griffin and I are going to Walmart ... I have to buy a new pair of shoes. Yesterday a nail starting coming through the bottom of my "good" shoes ... normally I would go to JCPenny to find another pair just like them, but I need a few other things so I'm hoping to find something that will do at Walmart. We had some serious Summer fun at our house yesterday. It was a perfect Summer day ... lots of sunshine, lots of fun and good friends. Let's see ... who was here ... Melinda, Grayson, Carol, Hannah, Zachary, Sara, and Sam ... M & G left before I had a chance to snap any pictures of them. This was such a cute thing ... Griffin and Sam were swinging (thanks to some awesome pushing efforts by Hannah) ... Zach and Sara were at the top hanging their towels down ... the little boys would swing into them ... I tell you ... there were giggles galore going on. It was so cute! This picture of Hannah and Sara just SCREAMS Summer!! This is Carol ... H, Z, S and S's mom ... she is a way cool Mom and friend. This was probably one of the highlights of the day. When Griffin decided to dump a gallon of bubble stuff into the little plastic pool. The kids LOVED this. You have to click on the smaller image of this picture to see the larger version to see the sheer JOY on the kids' faces! Being outside in the heat calls for lots of tasty ways to beat the heat. Here Sarah and Griffin are enjoying a yummy banana popsicle. I tell you what ... I enjoyed one of these myself and it reminded me SO much of my childhood. And another cute moment. The banana popsicles were the kind that have two sticks. It was pretty funny because at the same time all of the kids realized they could pull them apart and make two popsicles. I'm so glad I captured this moment on film!! We are so lucky to have such good friends to spend time with ... we definately have to get together again really soon!! Want a sneak peak at what I've been working on? It's under MAJOR construction ... but I hope to have it completely finished in a week or two. I wanted to share a couple of other links with you too. Two people that are very, very dear to me are doing some wonderful things. My sister-in-law Bonnie is participating in the American Diabetes Association's Step Out To Fight Diabetes. Please Click Here to show your support for Bonnie's effort. My dear friend Andi is participating in the American Heart Association's Heart Walk. Please Click Here to show your support for Andi's effort. We are going to have a house full of friends today ... and I'm really looking forward to it. Hope ya'll have a great day! It's here again. The migraine. It's a once a month thing. I woke up at 5:00 this morning and it hit me square in the face. That pounding, nauseating, sick feeling that just overwhelms me. I went downstairs and took 2 Excedrin Migraine tablets and went back to sleep on the couch until about 7:00. The boys were still sleeping upstairs. When I woke up ... the headache was gone. I still have the nausea ... it will be with me until about 3:00 or 4:00 this afternoon ... but the dreaded, pounding headache is GONE. I do not know how I lived without Excedrin Migraine before. Actually I do ... I suffered through it. Thank God I finally found something that works for me. Needless to say ... we are staying home today. This post shows a date of Monday 6/23 ... that's because I added the pictures yesterday, however I wrote the post this morning. This IS my Tuesday post. Both mornings over this past weekend Griffin climbed out of his crib. We knew the day would come when we would turn his crib into the toddler daybed version of his bed ... we just thought we might have a little longer in the crib. We figured since he was climbing out of it anyway ... it would be safer to go ahead and change it over. Eventually we will turn into into the twin bed version of the bed ... but for now the toddler daybed will do just nicely! And doesn't he look proud in his "big boy bed"? I was nervous about him sleeping in the bed last night without any kind of rails up. I thought he might fall off of the bed. He actually did really, really well. He only got up once right after we said our goodnights. Mike went back up and snuggled him in again and he didn't get up again until about 5:45 this morning when he came in and jumped in our bed. I'm soooo proud of him ... our sweet "little big boy" as Grandma calls him. And I have some fun news to share!! I won a drawing for some beautiful Core'dinations ColorCore Cardstock from Cecile! Click on her name to visit her awesome blog!! She is a wonderfully talented scrapbook artist, a terrific friend ... and an all around nice person!! Dare I say she's a southern belle? Yep ... she is!!! Please pay her blog a visit ... you will be happy you did!! She also creates some gorgeous paper piecings, scrapbook pages and handmade cards ... Click Here To See Cecile's Paper Piecings on Ebay! It is called Orecchiette with Mini Chicken Meatballs and oh my goodness was it yummy! If interested you can Click Here To Print out the recipe. I will also post the recipe below my pictures and note the tiny changes we made to the recipe. I've never used real mozzarella balls in a recipe before ... but I did last night! And we served it with this delicious garlic bread! I couldn't find orecchiette pasta ... so I used pasta shells instead. Instead of the grated ramono cheese I used grated parmesan. We had the parmesan on hand and I saw no reason to buy another product that was basically the same. I used grape tomatos instead of cherry tomatos only because our local grocery store did not have cherry tomatos due to the tomato scare. Mike added some italian blend spices to the sauce while simmering it. On this recipe it never, ever tells you to add the meatballs to the sauce. Actually it never tells you to remove them either. But yes ... you add the meatballs back to the sauce once you have the tomatos and chicken broth in the pan. We found that a little confusing. We made sure to cook the brew a little longer than the five minutes it recommends ... we did this to make 100% sure the chicken meatballs were completely done. Again ... this is a yummy, yummy recipe!!! It's fairly easy ... and it creates a HUGE amount of food. We will be eating left overs for awhile. Mike and Griffin were outside working on the tractor ... I had time to just sit there, look around and think about the area in which we live. I love where we live ... we have 10+ acres of property and it's covered with trees, flowers and animals. We even have a little creek that runs through our property. You never know when looking outside what animal you might see ... deer, rabbits, squirrels, and many types of birds. I'm keeping my fingers crossed that we never see that black bear I fear seeing one day! Okay ... so I was bored ... my rock creation. This is a great flag created out of old barn tin ... I love Americana stuff ... and this hangs on the front of our house. Our friend Robin got us this great sign as a wedding gift. She was a bridesmaid in our wedding. Did you know I collect Coca Cola memorabilia? I do ... even outside! We actually have two of these benches on the front porch. Many years ago I went on a business trip with Mike to New Hampshire. When he was working I took a drive and ended up in Vermont. That's where I found these. I love these benches ... it's a great gathering place when friends are over! My little garden is thriving ... yesterday I saw little itty bitty tomatos on the plant! My hydrangea is sprouting flowers for the first time ... that makes me happy! See this little icky bug? It's a Japanese Beetle and they are HORRIBLE!! The other day Mike came into the house and said "They're Back" and I knew exactly what he was talking about. They have infested our yard the past 2 years. We think they were larvae in some dirt we had delivered a couple of years ago. They attack our butterfly bushes, crepe myrtles, olive trees and fruit trees. Mike does everything he can do every summer to keep them under control. It is not easy. Though not a "favorite" thing ... I wanted to share. We have a huge area of wild blackberries growing ... they are so pretty! Once they are ripe, the birds always get to them before we do. And I do not know what it is about this rock ... but I love it. It sits under some pines covered with ivy ... I think it's just looks so whimsical. One day I will plant flowers or something around it. There are many, many more things I love about our property and yard ... these are just a few. I hope you enjoyed our little walk around.